Improving outcomes and supporting transparency part 1: A public health outcomes framework for England, 2013–2016. [UK] Department of Health, 2012. Sets out the structure and objectives of the public health system for England effective from April 2013 and how progress against these objectives will be measured, including addiction treatment completions, alcohol-related hospital admissions, and prisoners identified as needing treatment for alcohol/drug problems. 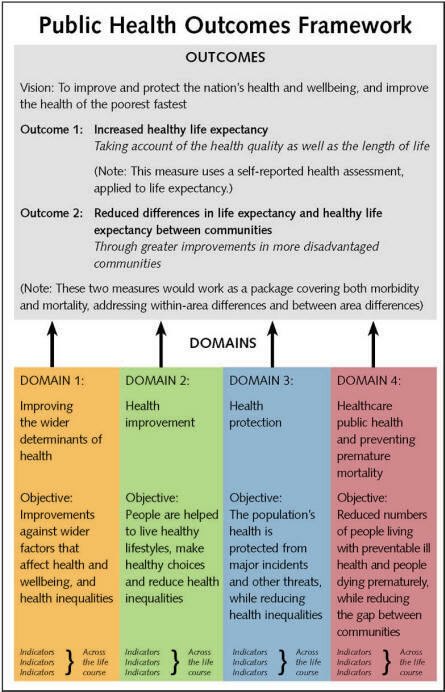 • reduced differences in life expectancy and healthy life expectancy between communities. These outcomes reflect a focus not only on how long people live but also on how well they live – healthy life expectancy, at all stages of the life course. The second focuses attention on reducing health inequalities between people, communities and areas. Public Health England will be the new national delivery organisation of the public health system. The NHS will remain critical to protecting and improving the population's health. It will be charged with delivering some public health services, and with promoting health through all its clinical activity, striving to use the millions of patient contacts that take place each day as opportunities to promote healthier living. Outside the clinical arena, the key responsibility for improving the health of local populations, including reducing health inequalities, will rest with democratically accountable upper tier and unitary local authorities. Each will have the duty to "take such steps as it considers appropriate for improving the health of the people in its area". They will set up statutory health and wellbeing boards to drive local commissioning and integration of all health services based on local needs. Local authorities will commission public health services on their populations' behalf, resourced by a ring-fenced grant, and put health and wellbeing at the heart of all their activity. Public Health England will support and advise directors of public health and local authorities to help ensure consistency and excellence across the public health system, for example through a single authoritative web portal on public health information and evidence. In this new system, the Secretary of State for Health sets the strategic direction, through this, the first-ever Public Health Outcomes Framework, and through leading for health across government. The featured document sets out the indicators which will be used to measure improvements in public health, defined in greater detail in the part 2 technical specification. Many relate to substance use even though this is not the focus. Among these are for example the sickness absence rate, deaths and serious injuries on the roads, domestic abuse, violent crime and re-offending, preventable deaths, and deaths from liver disease and communicable diseases. • [Mother's] Smoking status at time of delivery [of baby]. Defined as rate of smoking at time of delivery per 100 maternities. • Smoking prevalence – 15 year olds. Defined as the number of persons aged 15 who [in surveys] are self-reported smokers as a proportion of the total number of respondents with valid recorded smoking status aged 15. • Smoking prevalence – adult (over 18s). Defined as the number of persons aged 18+ who are self-reported smokers in the Integrated Household Survey as a proportion of the total number of respondents with valid recorded smoking status aged 18+. Smokers are defined as those responding "Yes" to the question, "Do you smoke at all nowadays?" • Successful completion of drug treatment. Defined as the number of drug users who left drug treatment successfully (free of drug(s) of dependence) who do not then re-present to treatment again within six months, as a proportion of the total number in treatment in a year. • Alcohol-related admissions to hospital. The preferred option would be based on just alcohol-related primary diagnoses, to minimise the risk of perverse consequences from any changes in coding practice. • People entering prison with substance dependence issues previously not known to community treatment. Defined as the number of individuals entering prison who are provided with a substance misuse triage assessment to determine dependence on drugs or alcohol, who then require structured treatment and who have not already received it in the community, as a proportion of the total number of people entering prison.